The Squier J5 Telecaster gives you a John 5 signature guitar with great style, tone and performance at a great value price to match! John 5 .. The Squier J5 Telecaster gives you a John 5 signature guitar with great style, tone and performance at a great value price to match! John 5, guitarist for Rob Zombie, is a self-confessed Fender fanatic and has referred to the Fender Telecasters as “the greatest guitars ever built, by far”. 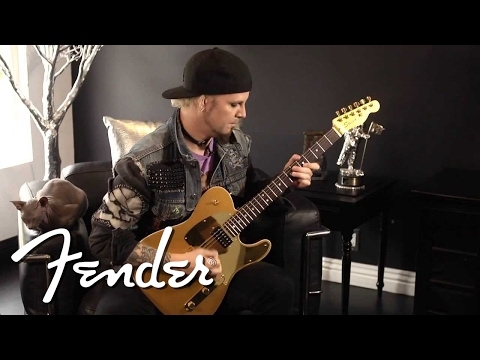 Now, you can own the Squier John 5 signature Telecaster – an awesome electric guitar based on John 5’s own modded Telecaster that he has used throughout his career. With its classic Telecaster design, the Squier J5 Tele has a distinctive body profile with a single cutaway allowing for each reach of the higher frets. Attached to the body is a modern “C”shaped neck which boasts a smooth back finish so it’s very fast and comfortable to play. Adding to the great looks of the J5 Telecaster, the Alder body is double bound with elegant white binding that beautifully contrasts with the solid black colour of the body and matching headstock. Allowing you to get that distinctive John 5 signature sound, the J5 Telecaster is equipped with custom-designed humbuckers. You can switch up how you use the pickups using the three-way pickup switch which allows you to choose from using either pickup individually or both at once. The bridge pickup is made with a ceramic magnet while the neck pickup features Alnico 5 magnets so you get two distinct flavours to play with. You can further shape your sound using the two volume controls, with each pickup having a dedicated volume knob so you can strike the perfect balance. With its all black colouring contrasted by the white binding and chrome/stainless steel hardware, the Squeir John 5 Telecaster looks awesome; just how John 5 would want it. Add in the custom humbuckers and great playability of a Telecaster guitar and you have all-around fantastic performance from a very affordable electric guitar. Buy the Squier J5 Telecaster for a John 5 signature guitar that offers awesome style, tone and performance but at a bargain price.